The entertainment capital of the world awaits those seeking apartment living at the heart of happening. A hive of activity, there is nothing quite like the glitz of Las Vegas and its vibrant reputation is well-deserved. As one of the most visited tourist destinations in the world, Las Vegas owes its fame to its liberal attitude to adult entertainment. The Las Vegas Metro is famous for its world-renowned casinos and nightlife which draw over 43 million visitors to the area every single year. Whilst some call it Sin City, others find joy in the one of a kind activities that can only be found in Vegas. Where else can you get married by an Elvis impersonator? While one may think that Las Vegas is no place to settle down, it might please you to learn that within the suburban areas lay quieter communities with plentiful outdoor parks and quality restaurants which are better suited to families who prefer small town living. Outside the neon highlights of the strip lies an unexpected formal business side to the Las Vegas Metro. Due to the growth in population over the last 10 years, the area serves as the leading financial, commercial, and cultural center for the state of Nevada. Though the hospitality industry provides jobs to many, it is actually the Clark County School District, followed by the Clark County government who rule the roost as highest employers in the area. More traditional entertainment can be enjoyed in the suburban neighborhoods, with thanks to The Smith Center for the Performing Arts, situated downtown in Symphony Park who put on world-class orchestral, opera, ballet, choir, jazz, and dance performances. Also in the downtown area can a prominent arts district be found which actively promotes its art galleries, films, previews and music celebrations. The Las Vegas landscape is dominated by its location within the Mojave Desert which provides sweltering summers in exchange for mild winters. A year-round warm climate makes visiting environmental pleasure sites such as Lake Mead, Red Rock Canyon National Conservation Area, Spring Mountain Ranch State Park and Valley of Fire State Park a popular day out. As an arid landscape, the character of the Las Vegas Metro is a world away from other states which can offer forest views or sunny beaches, yet Las Vegas does not lack scenic charm; distant mountainous regions as far as the eye can see and a choice of outdoor adventures make it a unique place to live. 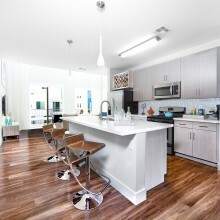 Choosing apartment living in the Las Vegas Metro area can certainly be vibrant and colorful. The wild personality of the strip is second to none but this is balanced by the peaceful suburbs which would appeal to a more placid lifestyle. With never a shortage of organized activities going on for tourists and locals alike, there is plenty to keep any age group entertained.